… “It’s just really tragic what happened,” said Tezeta Solomon, an Ethiopian living in Los Angeles who attended the memorial in Addis Ababa. …The crowd of hundreds gathered in the parking lot observed a moment of silence for the slain rapper, who was 33. According to initial reports, a young man opened fire on Hussle at close range before scrambling to a getaway car. The L.A. County coroner said Monday that Hussle, 33, whose legal name was Ermias Joseph Asghedom, died of gunshot wounds to the head and torso. He was pronounced dead at a hospital at 3:55 p.m. Two others were wounded in the shooting. Nipsey Hussle, born Ermias Joseph Asghedom, was remembered by city officials on Tuesday as a gifted artist and passionate advocate for the South Los Angeles community in which he was raised. Hussle, whose real name was Ermias Joseph Asghedom, was shot to death in front of Marathon Clothing, the South Los Angeles store he founded in 2017. Two other men were wounded in the shooting. The Grammy-nominated rapper is being remembered not just for his music but for his deep community involvement and activism. He had planned to meet with Los Angeles Police Department officials to discuss ways to fight gang violence in the city. 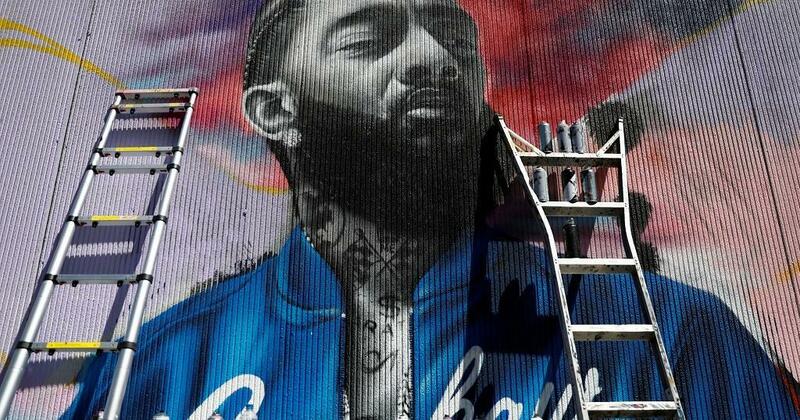 The murals have popped up all week following Hussle's death. One of the murals includes Lakers star LeBron James and rap legends Snoop Dogg and Ice Cube. The rapper was scheduled to meet on Monday afternoon with representatives from Roc Nation, Jay-Z’s entertainment company, and police officials to discuss how the community could support efforts to stop gang violence and help children in the area. Hussle performed with rappers from rival gangs, including YG and Joe Moses. Hussle noted that Moses was from the Van Ness Gangsters, a Bloods gang whose turf was nearby and which Hussle described as "one of our worst enemy 'hoods." "Hating [someone] just because of where he grew up and where his momma pays rent — we're trying to get above that and move beyond that," Hussle said in the 2009 streetgangs.com interview. …Chief Moore later added that Mr. Holder was thought to be a member of a gang, but that the police did not believe the shooting was related to gang rivalries. Mr. Holder was arrested later on Tuesday. ** I also read that Nipsey Hussle was also launched programs for STEM, Science, Technology, Engineering and Mathematics. He use his funds to try and build his community. Gosh, May He RIP.